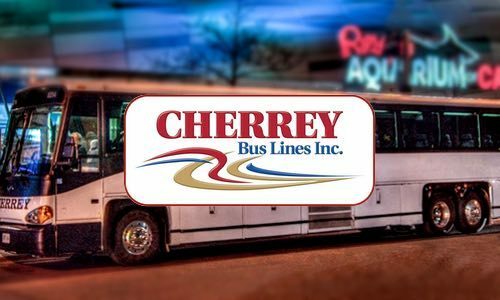 Partner Directory / Cherrey Bus Lines Inc.
Cherrey Bus Lines Inc. is a full service motor coach company that provides quality transportation services at an affordable price, in a safe, reliable and courteous manner. Family owned and operated, their dedication to customer service excellence means every trip will be a memorable experience. Beginning with a single school bus in the 1940’s, to the present day company which includes highway coaches, mini buses, activity buses, school buses and vans, Cherrey Bus Lines has grown to meet its customers’ diverse needs. Their multi and single day tours aboard deluxe motor coaches include a tour director to help provide a wonderful travel experience. Specializing in trips for schools, seniors, sports teams, weddings, private functions and church groups, they can help plan special tours designed to meet every group’s needs. Their excellent customer service and professional drivers set them apart. With an emphasis on providing memorable experiences that keep people coming back, Cherrey Bus Lines takes the time to understand each customer’s needs. Their Customer Service Representatives help to ensure every trip detail is taken care of, and staff is available to handle any emergencies 24 hours a day, 7 days a week. Trusted and well-trained, their drivers are consistently monitored to maintain an excellent safety record. As company ambassadors, each driver strives to make every journey relaxing and enjoyable, leaving a great lasting impression on their customers. Safety begins with the maintenance and servicing of their vehicles. With over 40 years of experience, the mechanics at Cherrey Bus Lines are second to none when it comes to safety. All of their buses are equipped with the latest GPS monitoring technology, which allows them to track all of their motor coaches 24 hours a day, 7 days a week. Robinhood Tours and Maxey Travel are divisions of Cherrey Bus Lines, and offer complete, worry-free travel arrangements for air, cruise, rail and special destinations.